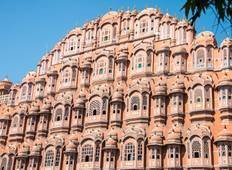 Discover cultural tours in Rajasthan in April 2019, visiting places like Jaipur and New Delhi. Book now and save with TourRadar.com! "The tour was amazing.I had a wonderful time." "Our driver, Benny was amazing! Always on time and got us from a to b safely and efficiently...."
"I took this 09 days tour. The tour was good and filled with local activities, as..."
"Fantastic tour with lots of attractions and briliant moments oraganised in a perfect..."
"Everyone was great and so helpful! Tour guides were so knowledgeable! Loved the tour!" "This tour was amazing from start to finish. It was so smooth and easy in what would..."
"I was a solo 45 year old female traveler - and this was the perfect tour to experience..."
"This was a great trip that both my daughter and I enjoyed together. There was a driver..."
"Definitely saw a lot more of india than I would have on my own. 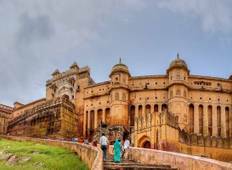 Taj Mahal one of..."
"Dear Narendra . I want to thank you very much for you generous hospitality. We had..."
"HolidaysAt Heritage Rajasthan trip has a great itinerary, from big cities to small..."
"We had a great experience during our tour as Ram our tour guide was very knowledgeable..."
"I visited India with my husband, the trip was wonderful and itinerary was good, driver..."
"We had an awesome trip to delhi Agra Jaipur, which was arranged by ghum India ghum..."
"I completed the royal tour wth Rajasthan which I would recommend as good rather than..."
"We did this tour earlier this month and we must say that service of Swastik India..."
"The agent is very efficient and helpful in handling any matter that arise during..."